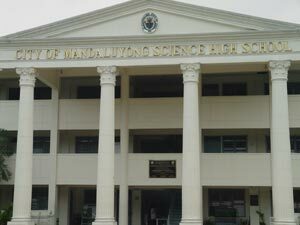 The left wing of the CMSHS building was constructed in 1996.By June 1997 the students occupied the new classrooms. Before end of December 1997 the right wing was completed then, computers, tables and chairs were delivered. On February 12, 1998, President Fidel V. Ramos signed into law, House Bill 7492 authored by Rep. Neptali � boyet� Gonzales II,thus Republic act no. 8497 was born enacting that a science high school be established at barangay Hulo, City Mandaluyong and appropriating funds therefore. The completion of the water reservoir and toilet facilities ensued, followed by the fa�ade, basketball court, and lastly, the landscaping, with the arrival of the new sets of computers and construction of the speech laboratory sponsored by Eduardo Cojuangco. The unveiling of the CMSHS marker took place on August 30, 1999 with His Excellency, Joseph E. Estrada, President of the republic of the Philippines as the Guest Honor.President Estrada was joined by House Speaker Manuel Villar, DECS Secretary Andrew Gonzales, Press Secretary Gerry Barican, Majority Floor Leader Manuel A. Roxas II, Tourism Undersecretary Ram Antonio And Presidential son JV Ejercito, founders of the school and constituents of the city during this special event. Natural, environmental and human resources must be saved, protected, conserved and developed fort today and the generations to come; and -One�s knowledge and talents bring real happiness if shared and applied positively and selflessly.